VMM - Robust and Open, Stale and Proprietary or Somewhere In Between? Last week I wrote an article about what appears to be an upcoming standards battle pitting the OVM vs. the VMM. My comments seem to have touched a nerve with a large number of people and prompted comments from Janick Bergeron of Synopsys, Dennis Brophy of Mentor and Ambar Sarkar of Paradigm Works, among others. Since this thread is starting to take the form of an all out smack-down, I figured perhaps the readers of this site could help me pick out appropriate avatars for Janick, Ambar, Dennis, and myself. Figured out who's who? Good, now let's continue! The VMM is not open. The VMM is not as feature-rich as the OVM. Ambar commented on the need for an open reference implementation of any potential standard verification methodology library. He also bemoaned the lack of support for the SystemVerilog standard among the EDA vendors, and ended with a comment that the verification community "may not have the stamina or patience for morphing VMM/OVM into yet another methodology." Finally, Dennis challenged Synopsys to "post their customer & partner license terms and conditions," the implication being that Synopsys uses restrictive licensing agreements with its customers. Comments on "The Brewing Standards War"
Updated 2/25/2008: Fixed a typo. I wanted to let everyone know there have been some interesting and important comments to my post on "The Brewing Standards War", including one from Janick Bergeron of Synopsys and one from Ambar Sarkar of Paradigm Works. I just got back to Austin and hope to respond to the comments within the next day or two once I get a chance to recover from my trip. In the meantime, please feel free to add your own thoughts if you'd like to add to the discussion! FYI for those of you who read Cool Verification via the email subscription mechanism... In my post yesterday evening about the DACeZine roundtable discussion, I mentioned the Seinfeld episode, "The Comeback". There is a pointer to a YouTube clip of the episode on that page that didn't show up in the email. The clip cracks me up every time I watch it so if you missed it, check out this link (or go back and reread the original post). 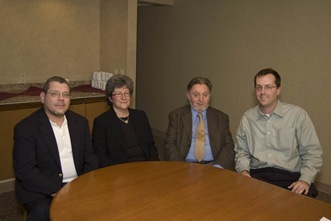 Update 12 March 2008: The DAC eZine article "Where Did You Hear That" containing the transcript of the roundtable discussion was published last week. Check it out! I was involved in the discussion (that's me on the far right minus my signature beard, ski hat and sunglasses) as the token blogger, who also happened to be an engineer. Any discussion of old vs. new media has to include a token blogger these days! Gabe and Dave were representing the media, and Limor was representing a typical engineer and consumer of media information (who just so happens to help run a research laboratory for a large multinational semiconductor company :-). The winner of DVCon best paper award for 2008 is Kelly Larson of MediaTek for his session 2.2 paper entitled "Bridging the Application and Design Gap: Utilization of the GDB Proxy Protocol for Remote Control of an RTL Simulation." Congrats Kelly! Additional info about the conference - the attendance set a new record at greater than 800 registrants. Also as an FYI, next year, the conference will be held February 24-26, 2009. Back in August when the OVM was announced one of the big unknowns was how Synopsys was going to respond. If Karen Bartleson's recent post on standardizing verification methodologies is any indication, the response is going to be to attempt to slow down and gain some element of control of the OVM via a drawn out battle in an Accellera standards committee. Updated 2/21: Cleaned up photo formatting. Phew. It's been a busy day! Since I'm nodding off as I'm writing this, I thought I'd give a brief summary of what I was up to today and highlight some of the photos I've taken. Hopefully tomorrow morning I'll have a chance to write things up in a bit more detail. The Expo Reception Needs Change Bars! 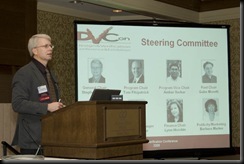 My first EDA conference was one year ago at DVCon 2007. At the time I was thrilled to get the opportunity to speak with vendors about upcoming new products and to listen to presentations about the various methodologies people were using to solve real world problems. The same general feeling held true at DATE last April and even to some extent at DAC. By CDNLive! in September the feeling was long gone. This evening as I wandered around the DVCon Expo reception, I had very little desire to quiz the vendors on their products. What I wanted instead was to see a list of the things that were different this year from last so I could quickly decide where to focus my limited time and energy. So, on that note I'd like to ask if any of the vendors presenting at the conference this week or demonstrating their wares at the Expo are willing to describe to me exactly why I should be interested in speaking with them this year (vs. last year). If so, please send me a note or catch me in person tomorrow or Thursday. Otherwise, I'll just sit back and wait for the dance war competition on Thursday afternoon! (BTW... Cliff seemed to find the title of the post amusing... Stew Stu? Not so much ;-). SCDsource - A Breath of Fresh Air or More of the Same News For the Hardware Design Community? For the last several months I've been on the mailing list of Richard Goering's new media venture - SCDsource. The newsletter and associated website were created back in the fall shortly after Goering was laid off from EETimes. SCDsource is billed as a new kind of news source for the hardware design community. Due to the recent writers strike here in the US, most of the regular TV shows this fall were replaced with reality shows where writers were not required. One of those shows was entitled Dance War: Bruno vs. Carrie Ann. I have to admit to watching Dancing With the Stars, where Bruno and Carrie Ann were judges, but with Dance Wars, TV producers went too far. The premise of the show? Former "Dancing With the Stars" judges Bruno and Carrie Ann face off, each with a hand selected team of dancers, to see whose team can perform the best song and dance number.